Surrounded Islands? What in the world is that all about, you ask? Well, it might have been a turning point in Miami's history. The city was extremely troubled during the 1960's, 1970's and early 1980's with a myriad of crises and crime. The drug wars, Colombian Drug Lords, and "Cocaine Cowboys"
The violent Miami race riot. The history of Miami in that era was dark and the future looked even darker. Then along came a couple of artists with an idea that initially almost everyone laughed at, but ended up loving. Christo Vladimirov Javacheff and Jeanne-Claude were a married couple who create works of art based on environmental themes. 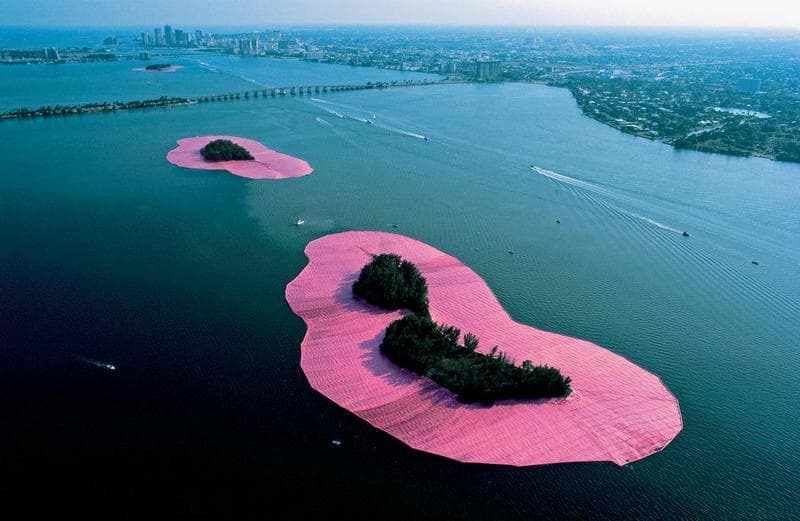 These artists planned a project to surround 11 uninhabited spoil islands in Miami's Biscayne Bay with 6.5 million square feet of pink polypropylene floating fabric. The floating exhibit would last two weeks. The islands to be surrounded were in Biscayne Bay in the cities of Miami, North Miami, Miami Shores and Miami Beach. This was a project that a lot of people laughed at. It seemed to many to have no redeeming value, especially since it would only be in place for two weeks. The environmentalists were initially against it, predicting serious harm to the marine life and vegetation of Biscayne Bay. The permitting agencies did what they do best: find ways to stop the project from being permitted. Finally, with the help of high powered environmental, engineering, construction, legal and political consultants, the artists got the permits to do the project. Volunteers, contractors, engineers and consultants worked on the preparation of the islands. Crews working in the bay and on the islands picked up debris, put the nasty junk in bags, and hauled it away. All told, they removed some forty tons of varied garbage including refrigerator doors, tires, kitchen sinks, mattresses and an abandoned boat. From November 1982 until April 1983, 6,500,000 square feet of woven polypropylene fabric were sewn at a rented Hialeah factory into 79 different patterns to follow the contours of the 11 islands. A flotation strip was sewn in each seam. At the Opa Locka Blimp Hangar, the sewn sections were accordion folded to ease the unfurling on the water. Floating rafts of fabric and booms were towed through the Bay to each island. There were 11 islands, but on two occasions, two islands were surrounded together as one configuration. As with Christo and Jeanne-Claude's previous art projects, Surrounded Islands was entirely financed by the artists, through the sale of the preparatory pastel and charcoal drawings, collages, lithographs and early works. Finally, on May 7, 1983 the installation of Surrounded Islands was completed. That was the day that the islands located near Bakers Haulover Cut, Broad Causeway, 79th Street Causeway, Julia Tuttle Causeway, and Venetian Causeway came alive with the exhibit. The islands were surrounded with pink woven polypropylene fabric covering the surface of the water, floating and extending out 200 feet from each island into the Bay. 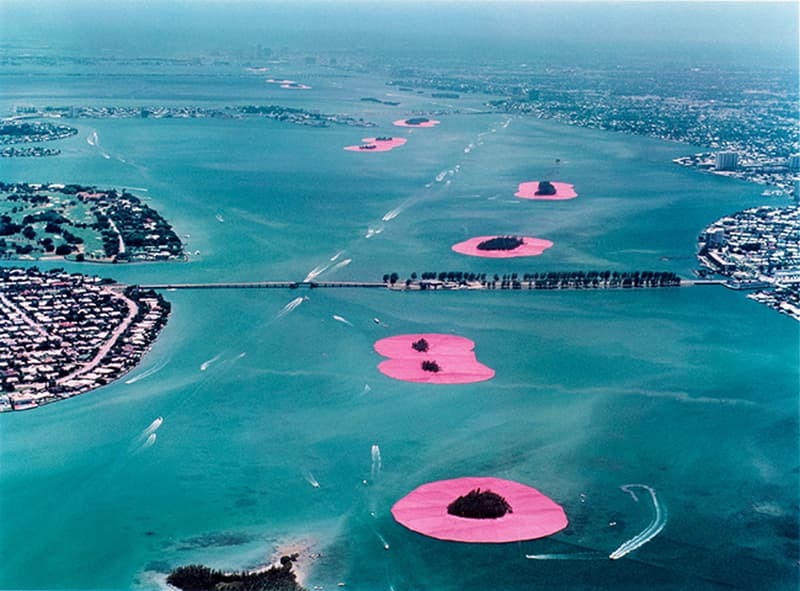 For two weeks in 1983, Christo and Jeanne-Claude's Surrounded Islands remained floating along the 7 miles of Biscayne Bay. It was seen and enjoyed by Miami residents and tourists staring in wide-eyed wonder from the adjacent causeways and from airplanes and boats. Suddenly one of the inspirational things to do in Florida was to drive down to Miami and look at the Surrounded Islands. Many people did just that. The shiny pink color of fabric floating in the bay seemed to be perfect for the tropical vegetation of the empty islands they surrounded. 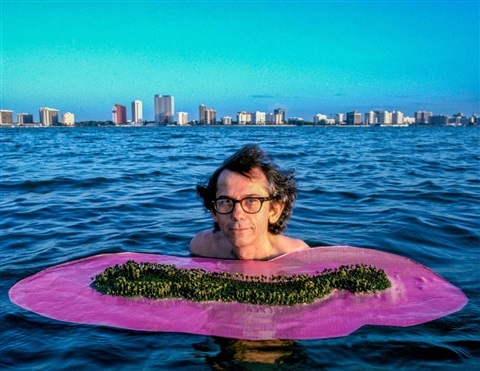 Surrounded Islands was a work of art that underlined the various elements and ways in which the people of Miami live between land and water. The project seemed to bring together the elements of a battered community who worked together to create something of beauty. When it was completed, nobody was laughing anymore. Somehow, Miami felt put back together again.